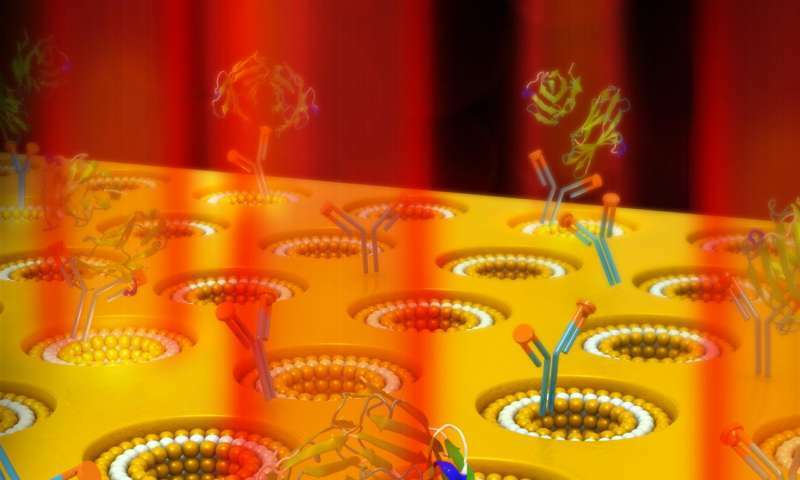 A new plasmonic sensor developed by researchers at the University of Illinois at Urbana-Champaign will serve as a reliable early detection of biomarkers for many forms of cancer and eventually other diseases. The sensor has been proven reliable to detect the presence of the cancer biomarker carcinoembryonic antigen (CEA) to the magnitude of 1 nanogram per milliliter. Most humans carry at least some amounts of CEA with an average range of 3-5 nanograms per milliliter. The researchers chose to focus on CEA because its presence in higher concentrations is an early indicator of many forms of cancer, including lung and prostate cancers. "Cancer is one of the major causes of death in the United States as more than half of the new patients are diagnosed after it has already spread," Ameen explained. 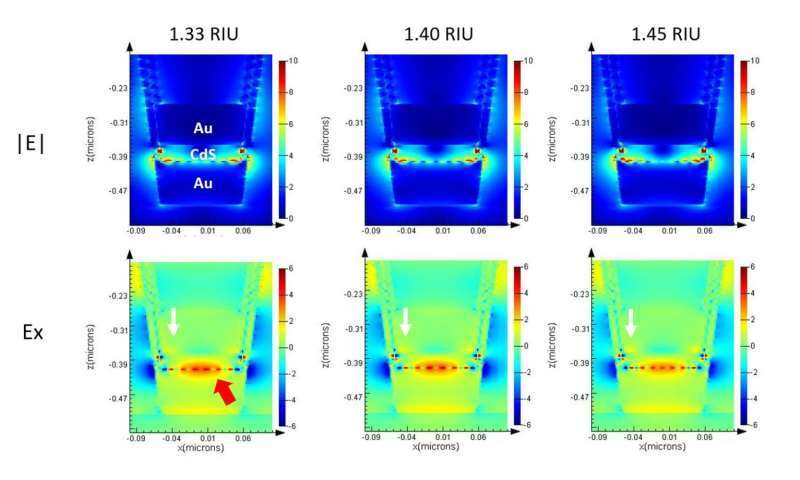 "This shows the gravity with which this problem needs to be addressed and this new design of a plasmonic sensor helps to detect the lower concentration of CEA at an earlier state." The plasmonic sensor is an improvement of the current state-of-the-art method for a few reasons. First, it was able to improve the limit of detection by at least two orders of magnitude. In fact, most methods aren't able to accurately detect the presence of CEA until it reaches a higher concentration. Secondly, because it works with much less instrumentation, it is less expensive and more portable and doesn't require nearly the expertise to make a reading. It also means instead of needing a vial of blood for a test, a simple finger prick will do. This aspect will be especially important for those who don't live close to an advanced medical facility, including those in developing nations. The research team was led by Logan Liu, and Lynford Goddard, associate professors of electrical and computer engineering with students Abid Ameen and Lisa Hackett carrying out the project. The team published its results in Advanced Optical Materials as a cover article. The device combines two sensing methods, which hadn't until this time been able to be used together. First, it uses a 3D multi-layer nanocavity in a nanocup array, which allows for the light to be stored in the cavity comprised of two metal layers (in this case gold) surrounding one insulator layer. Secondly, it uses plasmonic sensing, which detects sensitive nanoscale light-matter interactions with biomolecules on the device surface. It produces an enhanced field confinement and an enhanced localized field. Because of the plasmonic structure, the light is out-coupled more efficiently as the surrounding refractive index changes. 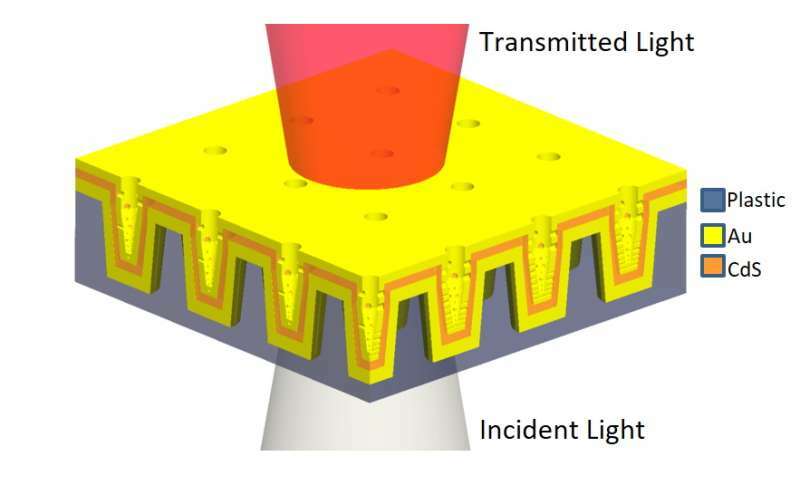 "By combining plasmonic properties and the optical cavity properties together in one device we are able to detect lower concentration of biomarker by light confinement and transmission in the cavity layer and from the top of the device respectively, based on the thickness of the multilayers and the refractive index of the cavity layer," Ameen explained. "The nanocup array provides extraordinary optical transmission," Hackett added. "If you take a thin metal film and try to shine light through it, there will be almost no light transmitted. However if you put a periodic array of nanoholes, or in our case a nanocup structure, then what you see is a resonance condition where at a certain wavelength, you will have a peak in the transmission through this device." Because the resonance is changing at a single wavelength and because the spectral features have reference locations, excitation and detection can be done reliably without any specialized equipment. With this device, a LED light source can be used instead of a laser and a photocell or camera image can be used instead of a high-end spectrometer. "Because of our multi-layer high-performing plasmonic structure, we were able to very efficiently scatter out the light to the far field," Hackett said. "When you increase the refractive index of the sensing region, it causes the stored energy to couple out. Usually when you have these types of refractometric plasmonic sensors, you have a shift in the angle or a change in your wavelength when the resonance condition is met. In our case, because we have incorporated a nanocavity, we have a fixed resonance wavelength." As the concentration of biomolecules (in this case CEA) increases, so does the refractive index, which produces an increase of the transmission intensity at a fixed wavelength that can be easily detected. "What that means in the future is we can take this sensor, which we've optimized and incorporated with an LED and have the most compact instrumentation, in fact no sophisticated instrumentation at all," Ameen said. "This allows high performance plasmonic sensing the ability to go toward portable sensing systems and large scale portable sensors." For now, detection methods for cancer biomarkers are being implemented in high-risk patients, especially cancer patients in remission. They take time, specialized equipment, and are labor-intensive. In the future, however, because of the portability and inexpensive nature of this method, it can be more easily administered to any patient at routine check-ups. This would allow those with an elevated concentration of CEA to be treated even before cancer cells spread in the body. "Right now cancer is detected closer to end stage," Ameen noted. "We want to detect it as early as possible. Our device is providing us with that opportunity." While this study demonstrated detection in a small human serum sample, the method could be used for the detection of other diseases down the road. "In the future, if they are made very cost-effective and portable," Hackett said, "it would be great to see people be able to take more control over their health and monitor something like this on their own."